Yes, you read it right – beer syrup. What, you ask, exactly is that? It’s a lovely elixir of almost unbelievably luscious flavors made by using beer in reductions and, well, to make syrups. On pages 197 & 199 of the new (totally fantastic!!) Beer Pairing book by Julia & Gwen, they cover making syrups. I’ve got some in my fridge from the prep I did for the Big Beers festival in early January. For the seminar I lead, I had simmered various fresh citrus fruits & dried vegetables in beer. Once the fruits and vegetables were done, I saved the liquid. Almost every liquid in my kitchen finds a new life in other dishes. At a minimum the worms in my compost pile are extremely happy with what we give them! 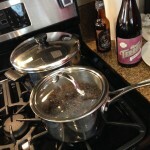 Making beer syrup is quite simple with perhaps the most difficult part simply deciding which beers to reduce. Caveat: very bitter beers are not good candidates, as they can get very unpleasantly tannic. (I first learned this in cooking prep for the TFOB). It’s not what you or the beer really wants. All the same, experiment and cook a variety of beers down to see what you get, taste every few minutes to learn more about what’s happening and how the flavors change until you find what you want. I love sharing new ideas with hungry audiences – Vail rocks! (yum). They’re quite versatile so get creative. 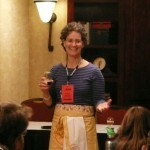 Lucy Saunders, long time food & beer pro, is an outstanding resource for cooking with beer. Her books are useful, fun and a delight for the enthusiastic cook using beer in the kitchen. And I’m just starting to get to know Adam Dulye, beer chef for the BA. When you find yourself looking for a new idea, make some beer syrups. I guarantee it’s beer as you’ve never had it before and well worth while. Oh, and sipping on a beer while you’re cooking is the best way to happily wait for the alchemy to happen.